We followed the trail toward Cha-pekw and found the werrp hiding in a log with a beautiful marble. We will keep her safe and sound until she’s ready to fly off on the next leg of her journey. Today this beauty set out on her new adventure after of course being shown around we went hiking and to the beachs ( where she decided to stay)..im so thankful for our short time spend maybe ill get the chance to see her again in the future..
On this cold and wet morning i followed the sound of the falls to find this beautiful monarch and very cool toad. I felt it was only right to bring them inside to warm them up before releasing her back into nature with a new friend. Monarchs hold a special place in my heart, growing up on the central coast I had a monarch butterfly tree in my backyard ♥️ I would lie on the ground under the tree and watch the stacks of butterflies upon butterfly appear to make the tree come to life. So when I saw this butterfly coin get set free, I felt it calling me. The monarch took along a slimy friend who has left its mark in my journal and now resides with me. And now we helped this social butterfly move on to its next adventure. It heard the trickle of running water, saw the flowers blooming here and took flight but not before taking with it a new friend. Oh the adventures that await this butterfly! -and who knows where the toad will go? This Monarch's mission is to be hidden alongside a marble in any Facebook marble hunting group. The marble will be for the finder to keep and the coin is to be passed along in every subsequent hide along with a new marble or glass related item for the finder to have a treasure to remember the joy of the hunt. Please log when you find the coin & details of the adventure you have set it free on. Feel free to add surprises & twists & turns to its journey. 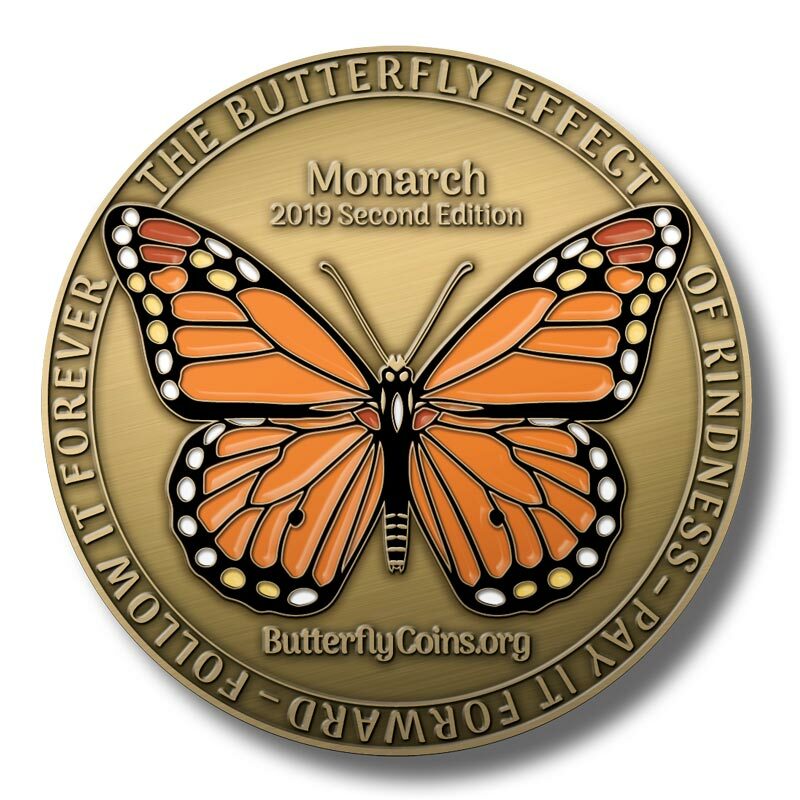 Let's watch the butterfly effect of our Monarch coin as it flutters throughout the marble hider/hunter community.